Collaboration software refers to those computer-aided work processes used by a team or group of people working towards a solution to a problem or the accomplishment of a project. 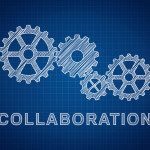 In our article we will discuss the most popular ways to create a good collaboration system for a company that will ensure a smooth and effective work on a project. 1. Electronic communication tools provide the fastest method to make the exchange of data and information easier. Email, facsimile, voice mail and web publishing enable the sharing of data, documents and messages through conventional means. Under this category also falls synchronous conferencing or real-time chat. This is distinguished from asynchronous conferencing where there is delay in message exchange. Bulletin boards, online forums, blogs and newsgroups are an example. 2. Electronic conferencing tools offer a more interactive set of features as they usually include real-time exchange and face-to-face capabilities. Examples are instant messaging, online chat, video conferencing and web based electronic meeting systems. 3. Collaborative management tools are better suited for group work, especially project management. Falling under these tools are electronic calendars; online proofing, which is popular among designers; online spreadsheets and enterprise bookmarking,among others. In setting up a virtual office, it is a must to enforce the best practices in collaboration software to enable one to achieve work objectives. Doing this ensures that every little detail of your project is accomplished and no deadlines are missed. Keeping the communication lines open also promotes synergy and cooperation among team members. There’s another disruptive tool today, social media, and it’s discussed further here in the future of collaboration software. Furthermore, you can look at these tools as real time or non-real time collaboration. 1. Your software can only work properly if it is fully used according to the purpose it was intended for. In this regard, a project manager is well advised to map out a communications plan that spells out in detail all the functions, responsibilities and expectations for each team member. The plan should spell out in detail the communication methods to be used by your team, frequency of communicating, posting of status updates, the schedule to be followed, line up of meetings, designation of tasks, and other important matters. As the project progresses, it would be much easier to make a comparison of expectations vs. performance or promises vs. delivery. This is only possible if everything is put into writing using the best practices in collaboration software. 2. Technology sharing is another important aspect when considering the best practices in collaboration software. This is specially advisable if your staff is working on different locations or have to be mobile. Adopting the best method of communicating with team members have to be weighed in based on ease of use, flexibility and scalability of communication tools being used. If it’s audio or video, voice or picture reception must be impeccably clear; if it’s instant messaging or chat, cloud hosted delivery must be seamless. Likewise, such factors as archiving or storage of data, security and accessibility must be considered because you would want your project to proceed hassle-free. 3. Managing a virtual team is also about the leadership of the project manager(s). We imagine that adopting a leadership style in the virtual world is quite different from how it is in real life. Even if the management is web based, it is still important to deliver your message across with clarity and to delegate effectively using the communication tools provided. Motivating and disciplining staff to meet their deadlines and comply with deliverables depends on the attitude and inspiration provided by people at the top. What Does Collaboration Software Stand For?